For the very first time we want to give you some Italian music. To tell you the truth this is actually the second time because I have already talked about Giorgio Moroder in a previous post (click here). Italy has a great music tradition in Opera and in Classical music, nobody can deny that, but what about “modern” music? I mean, considering the fact I am not into Opera and Classical music, I don’t listen to any Italian music. That must be a reason as I consider myself really open to any good sound. If we are not brilliant in music we are great in movies. Fellini, Rossellini, Antonioni, Bertolucci, are just some of our most honoured directors! This CD, Beretta 70 roaring themes from thrilling Italian police films, is a collection of some of the finest tracks from the 70’s ultra violent police/crime movies. Do you like Quentin Tarantino? I am sure you do. That is where he took inspiration. This sort of movies, so called B-movies, describes Italy’s cities full of corruption and crime. On the other side Police fight the mob with unorthodox praxis. Many of the films were made on low budgets and in times of political tension and censorship as Italy was rocked by terrorism. In one of this movies in the 1974 also the great Isaac Hayes was involved. The sound is a pretty nice blend of 70’s funk and disco with of course an Italian touch. Close your eyes and start the engine of your Alfa Romeo Giulia, the city needs you and your Beretta as the crime is striking. Let’s roll! Here a trailer in English. 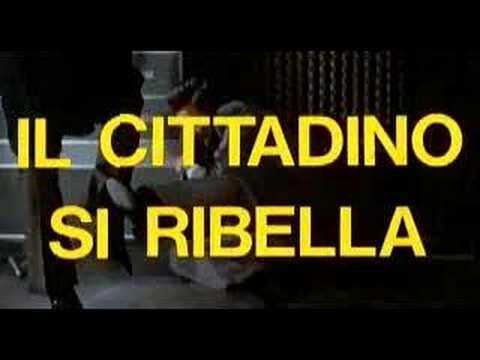 The movie is Il cittadino si ribella. This entry was posted on Wednesday, July 18th, 2007 at 10:32 am. It is filed under Funky Beats, Soundtracks. You can follow any responses to this entry through the RSS 2.0 feed. Nice post! I’ve been meaning to check out some old school Italian gangster and cop films (it’s the Grindhouse lover in me), so it’s good to hear that the music may be enjoyable, too. ah enfin de la musique italienne mr Marty ! very good. sorry i leave first this comment on daft punk post!!!! Great stuff – I really dig this post! I like the slant on modern Italian music.